Are the truths of God too difficult for a child to comprehend? 	Attributes of God (eternal, self-existent, omnipotent, omniscient, omnipresent, holy, loving, fair, Spirit, righteous). 	God is so awesome and great that we can never understand everything about Him because we are not God. 	What is the Trinity? God has three different parts (Father, Son and Holy Spirit). 2) GOD’S WORLD WAS PERFECT UNTIL SIN. Once a child is baptized it is important that we continue to nurture them and help them continue to mature in their faith. 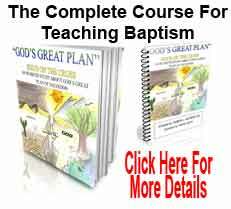 Are You Qualified To Teach Children About Baptism? Children are great at reading people. If you are not happy about teaching then they will pick up on that and are less likely to be attentive. If you are bubbly, energetic and appear to really enjoy teaching and really believe in the content of your lesson then children will feed off that. How Can We Know If A Child Is Ready For Baptism?